You'll be £28.00 closer to your next £10.00 credit when you purchase British Cruiser Warfare. What's this? Cruisers were the Navy’s maids-of-all-work, employed in a greater variety of roles than any other warship type. Smaller, faster and far more numerous than battleships, they could be risked in situations where capital ships were too vulnerable, while still providing heavy gunfire support for smaller ships or anti-aircraft cover for the fleet. As such, they were in the frontline of the naval war from the outset – and from its first days, the fighting provided unexpected challenges and some very unpleasant surprises, not least the efficacy of air power. Cruisers learned to deal with these new realities in the Norway campaign and later in the Mediterranean, partly through the introduction of new technology – notably radar – but also by codifying the hard-won experience of those involved. This highly original book analyses the first years of the war when the sharpest lessons were learned, initially describing every action and its results, and then summarising in individual chapters the conclusions that could be drawn for the many aspects of a cruiser’s duties. These include the main roles like surface gunnery, shore bombardment, anti-aircraft tactics and fighter direction, but also encompass technology like radar, asdic and shipborne aircraft, and even tackle more human issues such as shipboard organisation, damage control, the impact of weather and the morale factor. It also attempts to evaluate the importance of electronic warfare, intelligence and code-breaking, and concludes with a comparison between the performance of British cruisers and their Italian and German opponents. Thought-provoking and sometimes controversial, this is a book that should be read by everyone interested in the Second World War at sea. In the hundreds of book reviews I have written I don’t believe I have ever used the accolade excellent. Unreservedly this book is excellent... To anyone with a slight interest or a lot of knowledge I cannot commend this book too highly. With its accurate chronology, although obviously focused on the cruisers, and with its even more detailed sections that cover all aspects of a British cruiser, cannot be missed in the collection of fans of Naval history. An impressive work by a well known expert on the Royal Navy... For anyone interested in British cruisers, this volume is a must, and a worthy companion to the earlier Raven and Roberts volume. 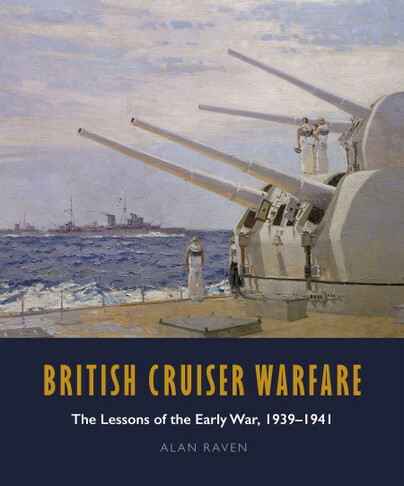 ALAN RAVEN is the well-known co-author of British Battleships of World War Two and British Cruisers of World War Two, both classic works in the field. He was also the leading light in the publication of warship monographs in the Ensign and Man’oWar series.